Craig Lucas‘ gentle yet profound fantasy, “Prelude to a Kiss”, dates from the late 1980s, a time when the burgeoning AIDs epidemic was moving artists to consider issues of mortality among young people. Lucas’ astonishing fable addresses the issue of AIDs obliquely (it is never mentioned in the play), but matters of homosexuality and heterosexuality, the loss of beauty, decay, the threat of death, the wrongness of the world are all touched upon. The premise of this often-produced play will be familiar to most audience members. At the wedding of Peter and Rita, a mysterious old man, unknown to any of the wedding guests, asks to kiss the bride. When he does so, they exchange consciousness. Now he resides in her body and she in his. The old man (with Rita inside) leaves the wedding and Peter and Rita (who is the old man inside) go off on their honeymoon. In subsequent scenes, Peter gradually realizes that Rita is, well, she’s just not Rita. Bit by bit, he realizes what has happened and sets out on a search for his love, whom he eventually finds in the old man’s body. All of this provides wonderful opportunities for humorous writing, peculiar love scenes (a love scene between a very old man and a very young man in which the old man is actually the young man’s beautiful bride? ), reflections on aging and mortality and the nature of romantic love. The play has remained popular, and is repeatedly revived, because of Lucas’ graceful and persuasive handling of these complex themes and his elegant comic dialogue. He makes us believe. The play works especially well as a showcase for the actors playing Rita and the Old Man, who have to convince us that their bodies are inhabited by one another. Allison Page as Rita and Richard Wenzel as the Old Man are entirely up to the task, delivering sterling performances good enough to send chills of wonder up our spines. They are supported by a skilled company throughout, with Nick Trengove exceptionally charming as Peter, the confused young husband who must provide the emotional backbone of the play. Director Stuart Bousel applies his usual deft touch to the dialogue and the movement, keeping the stage picture interesting at all times and plumbing the language for layers of meaning. A wonderful set by Andrew Cummings features a constantly moving cyclorama projection of clouds (created by Maxx Kurzunski), evoking an eerie feeling of otherworldliness and the quick passage of time. 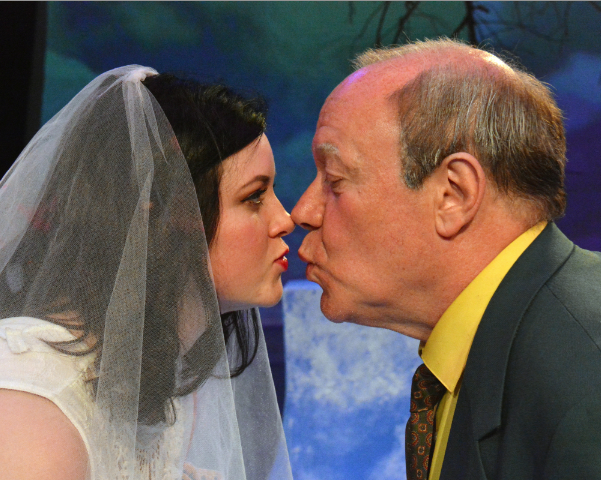 “Prelude to a Kiss” by Craig Lucas, produced by Custommade Theatre Company. Director: Stuart Bousel. Scenic Design: Andrew Cummings. Lighting/Video Design: Maxx Kurzunski. Costume/Props Design: Maria Chenut. Sound Design: Cole Ferraiuolo. Peter: Nick Trengove. Rita: Allison Page. Old Man: Richard Wenzel. Taylor: William Leschber. Tom/Minister/Jamaican Waiter: Charles Lewis III. Mrs. Boyle: Jan Carty Marsh. Aunt Dorothy/Leah: Elena Ruggiero. Dr. Boyle: Davie Sikula.